Often, the term “veggie burger” conjures up memories of some dry, unappealing patty that really has no business being included in the burger family. This is not that. The patty is a mixture of quinoa, chickpeas, oats and cornmeal with bell pepper and onion stirred in. I was definitely wary that they might turn out dry or flavorless but no – this meal was spectacular. 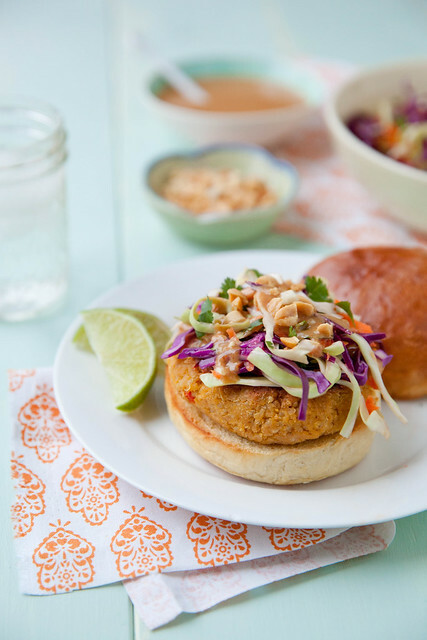 The patties are sturdy and filling, and while they taste pretty darn good one their own, they are amazing topped with the cabbage-carrot-cilantro slaw and sweet and spicy peanut sauce. We ate them on our favorite burger buns, but they are just as good sans bun. I made this meal over the weekend and I could hardly wait to share it with you. Though I’m not officially a vegetarian, we eat meatless more often than not. As a result, I’m constantly on the lookout for meatless meals that are every bit as filling and satisfying as something more carnivorous. These burgers are one of our biggest kitchen wins in a while, and I know we will be making them frequently. I’m already thinking about putting them on the menu again next week! In a fine mesh strainer, rinse the quinoa well. Shake vigorously to remove as much water as possible. Heat 1 teaspoon of the oil in a small saucepan over medium-high heat. Add the drained quinoa to the pan and cook, stirring frequently, until lightly toasted, 2-3 minutes. Stir in the water or veggie broth and bring to a boil. Lower the heat to a simmer, cover, and let cook for 15 minutes. Remove from the heat and let stand covered, 5 more minutes. Remove the lid, fluff with a fork, and set aside to let cool. In the bowl of a food processor, combine the chickpeas, oats, cornmeal, salt, paprika, garlic, and sesame oil. Process until the mixture is finely ground and well blended. Pulse in the egg until combined. Transfer the mixture to a large mixing bowl. Fold in the cooled quinoa, diced red pepper and onion, as well as an additional 1 teaspoon of olive oil. Stir together gently until evenly mixed. Form the mixture into patties (about 6-8, depending on the size you make). 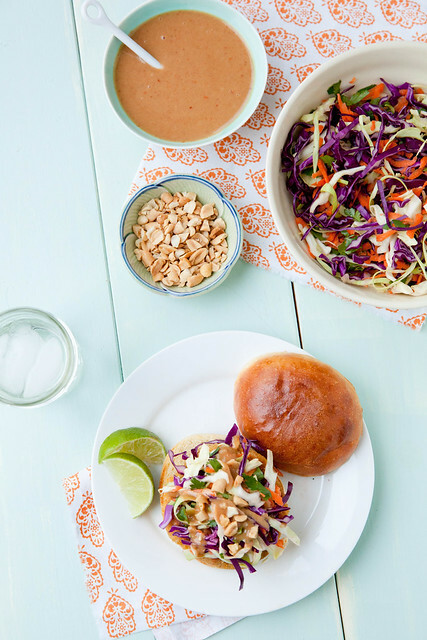 To make the slaw, combine the cabbages, shredded carrot, and cilantro in a bowl. Toss to combine. Set aside. To make the sauce, combine all ingredients in a small bowl or liquid measuring cup. Whisk together until well blended and smooth. To cook the burgers, add a generous drizzle of olive oil to a large skillet and heat over medium-high. Coat the bottom of the skillet with the oil. Add the patties to the pan and cook, turning once, until both sides are browned and the patties are cooked through, about 6-8 minutes total. Remove the cooked patties from the pan. 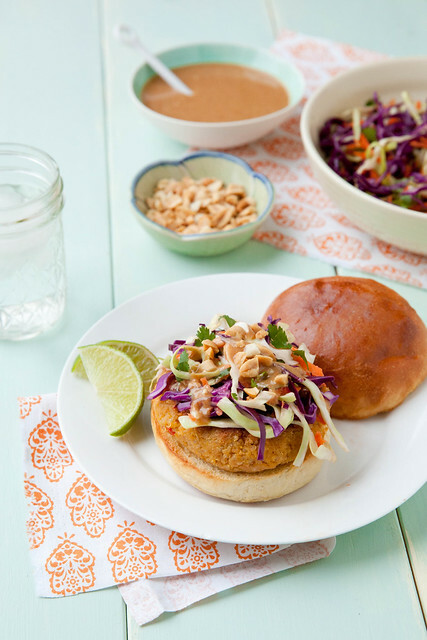 Assemble the burgers on toasted buns topped with the slaw, a drizzle of peanut sauce, chopped peanuts and a squeeze of lime juice, as desired.